James Doe's quest to collect the remainder of his $3.5 million hush-money from disgraced former House Speaker Dennis Hastert could soon face a major decision in court. A judge on Friday listened to arguments from both sides regarding a motion to dismiss the breach-of-contract lawsuit filed last month. The judge said he would take those arguments under consideration and rule by Nov. 29. In court Friday, attorneys for one of Hastert's victim's, known as James Doe, claimed Hastert was the first to reveal the existence of the alleged arrangement and said Hastert was trying to get out of paying the remainder of the deal "on a technicality." In a motion seeking dismissal of the case, Hastert’s lawyer has argued that the man has no further claim, because the statue of limitation had expired. But Doe, known previously in Hastert’s criminal case as “Individual A”, rejected that argument, at one point comparing the case to a parent who must make good on paternity to an illegitimate child. Hastert's attorney also argues that the lawsuit should be dismissed because Doe violated the confidentiality agreement when he spoke to federal authorities, citing a breach-of-contract. The parties return to court again Friday. 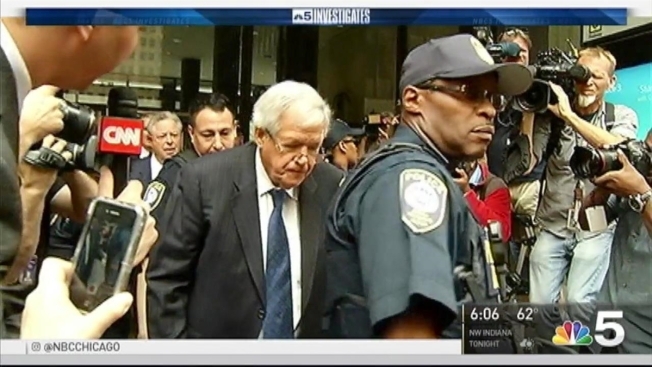 Hastert is serving a 15-month sentence at a Federal prison in Rochester, Minnesota.